Compilation64 is an attempt to archive the multi-game compilations that have been released for the Commodore 64. 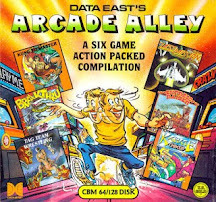 The idea for this archive originated from a discussion about favourite compilations on the forum of Commodore 64 website Lemon64. 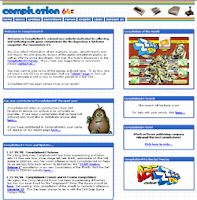 After a few forum members posted details of their favourite compilations, Lemon64 member “Gorkur” asked whether there was a site dedicated purely to compilations, which at the time there wasn't. Out of this forum thread, Compilation64 was born. Compilation64 was first served up in 2005 using a now defunct free hosting service called 5gigs. While fantastic initially, the host then seemed to experience problems - there were issues with the SQL database that powered the forum, leading eventually to reliability issues and the eventual shut down of the free host. Step up Iain Black of zzap64.co.uk who offered free hosting on a sub-domain in 2008. The site was 'transferred' and all was fine for a long while until Compilation64 suffered further problems with a separate host where the scans were stored. This meant that the site worked, but calls to the scans resulted in errors/missing scans. Gradually, the scans were (slowly) transferred to Iain's host and the scan viewing system was upgraded until August 2015 when all work files somehow became corrupt. The latest back-up was too old to continue upgrading so the site as it was was declared 'dead'. However, due to continued interest from visitors the content somehow needed to live on. Due to lack of time, it was infeasible to develop a new bespoke site, so it was decided to move over to some kind of content system such as Wordpress or Blogger to allow for easier future updates. For various reasons, Blogger won and the results you are reading/viewing now.